Overview: We had booked a safari at Devaliya Interpretation Zone at Gir at 9am. So we started from Diu at around 5:30am so that we could reach their on time. The distance from Diu to Sasan Gir is around 100kms so we kept a driving time of 3 hours and 30 mins buffer. We had some confusion on whether to book a 3 hour safari into the Gir forest or 1 hour safari to the Gir Interpretation Zone, where a smaller fenced area of Gir has been created so that more animals can be spotted. The decision proved good in the end after we spotted the Asiatic Lion, Jackal, Vultures, Wild Cat, Leopard and a few migratory birds. Spotting these animals in their natural habitat was a great experience early in the morning. It took around 1.5 hours from the safari starting point to return to the same place. The ticket cost is Rs 200 per head, and Rs 200 for camera. We had to pay an additional Rs 1900 for the gypsy. From here, we headed to Junagadh, around 1.5 hours drive from here. We first saw the 3rd century Girnar Ashokan inscriptions. The rock is well protected in an enclosure, and contains the inscriptions of Ashoka, along with Rudradaman I and Skandagupta. From here, we went to the Uparkot fort, and first saw the Jama Masjid inside the fort, followed by the Buddhist caves. 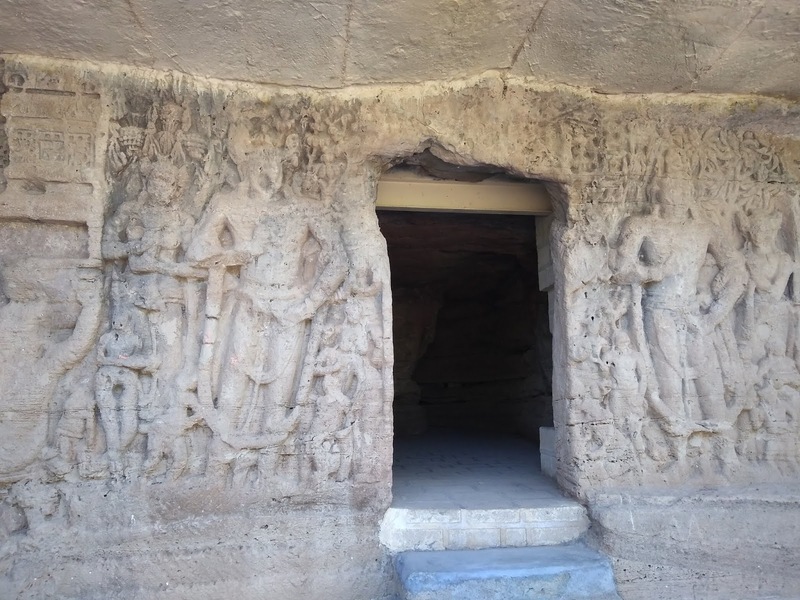 The Buddhist caves are 3 tiered, and date back to the 3rd century BC built in Satavahana style of architecture. Several carvings are worn out due to the age of the structure and some seem to be damaged during excavation. 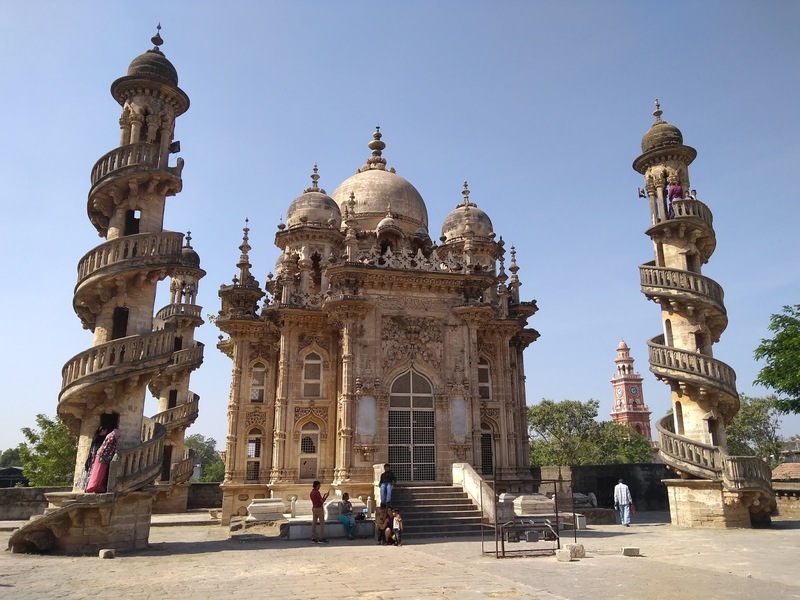 There are other important monuments inside the fort, but we decided to skip the rest and headed towards Mahabat Maqbara, one of the most prominent structures in Junagadh. The elaborate structures in the complex were home to the Nawabs of Junagadh in the 19th century. The Mahabat Maqbara has its unique style of twisted minarets outside the main mausoleum. We had the traditional Gujarati thali in Junagadh before we left the town. Inside the cave is pretty dark and is also filled with bat droppings. After admiring the caves, we headed towards Rajkot where we checked into our hotel. Visiting Gujarath is in my bucket list. Very beautiful photos. Such a beautiful and lovely place. Loved the picturesque landscape, great historical sites and the long stretches of coastal lines.